Steiff Cosy teddy Bear Cosy 2019 Year Bear, 113376 ~ Free Steiff Gift Box! 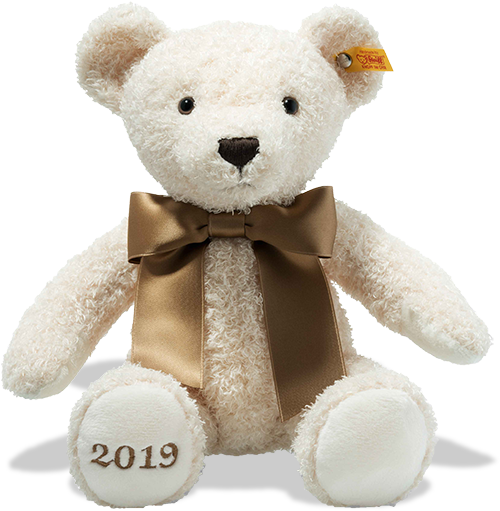 "With smart brown ribbon bow"
Here we have the Steiff Bear Cosy 2019 Year Bear which is made from cuddly super cream plush. This bear has a beautiful round face with a smart dark brown nose and two tone eyes - and a shiny satin-finished brown ribbon - how smart! To make sure everyone remembers the year 2019 - Steiff have embroidered this on one of the paws.